Work as a workout – Body Work! 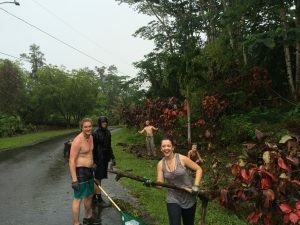 Many Volunteers and Interns who have worked on our community in the tropics describe themselves as feeling more fit and healthy than they have in years! 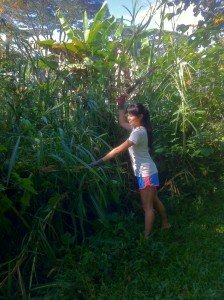 We have 4 acres of beautiful lush and constantly growing jungle so there is always a lot of physical labor! If you are from the city and have not done much physical work before do not get discouraged! We have plenty of things to do such as light weeding or cleaning which is not too strenuous! As long as you have enthusiasm and a willingness to learn then you will pick up new skills while you are here. Volunteer jobs for those who like BODY work! Weeding – We weed the invasive species and replace them with lush flowers, plants, fruits and trees. Eco-Friendly Arborist: Tree experts who can use a chainsaw are welcome to help us with the cultivation, management, and study of individual Hedonisia trees. As a tree farming community, we grow fruit and other trees that need TLC including topping so that they don’t grow so high! Sustainable Gardener: Assisting in ground preparation, planting, plant identification, composting, harvesting. The main focus is on increasing sustainability in eco-friendly farming in the Hedonisia Gardens. Landscaper – If you like working with a machete, a shovel a pickax or weedwacker then you will love our volcanic jungle landscape! Trail Builder: We have trails criss crossing the property that often need pick axing, rock packing, heavy lifting and moving buckets of earth to keep them walkable and safe. Community Maintenance: General Household duties for the Jungle Cottage, the Barn or for the Guest Accommodations. Community Beautification: If you have any skill such as natural home decor and see a way that you can contribute to beautify the property and it’s facilities then, as long as we approve it, you can be a Community Beautician! Sewing/Patching – Proficiency with hand sewing or using a sewing machine. We reuse broken tents by sewing them together into patchwork quilts for colorful tent windows, walls and doors. Painting – For those of you who find it soothing to paint, we try to use recycled paint or ‘oops’ paint for all our painting projects! Work with your Body Volunteers! Garden Tool Maintenance & Repairs – A Jack-(or Jill! )-of-all-Trades who can restore and repair some of our hand tools such as shovels, rakes etc. Repairs and Maintenance: A people friendly handy-person is always welcome at the Hedonisia as there is usually something on the property in need of repairs or improvement! Teaching Experience with Tools: Please state if you have weed whacker or chainsaw experience so you can safely demonstrate how to operate these tools safely with other volunteers. Wood Carver – We have scavenged a number of Ohi’a logs that were felled by the previous owner of the property. These native Hawaiian hardwood trees are perfect for carving. Carpenter – Repairing, improving and building small projects and custom furniture. 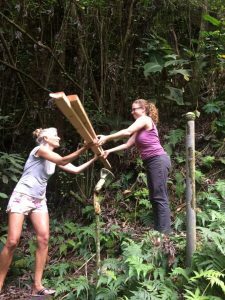 We try to use materials to build with such as Strawberry Guava which is a fast growing tropical hardwood that is an invasive species in Hawaii as well as our various varieties of Bamboo to create eco-friendly tourist lodgings such as Puka Hale.